In the first phase of our Restorative Flood Response efforts, the Council organized community meetings and site visits following the major storm event in January 2011. The initial community meeting involved presentations from guest speakers (slides and background information can be found here) and was followed by visits to neighborhoods impacted by recent storms. With assistance from technical experts in geomorphology, engineering, and restoration design, Restorative Flood Response participants explored potential actions that would restore floodplain processes and enhance habitat conditions for wild fish, while simultaneously reducing future erosion and channel migration risk. Restorative Flood Response Phase I emphasized that floodplain connection, habitat diversity, large wood log jams and other features of restoration can also reduce risk for homeowners and infrastructure. Additionally, these community meetings emphasized a need for collaborative efforts between adjacent landowners, recognizing that habitat restoration on a larger scale can benefit individuals. Collaborative efforts to manage flood risk through restorative measures build upon the Restorative Flood Response project initiated after the historic flood and major bank erosion in January 2011. 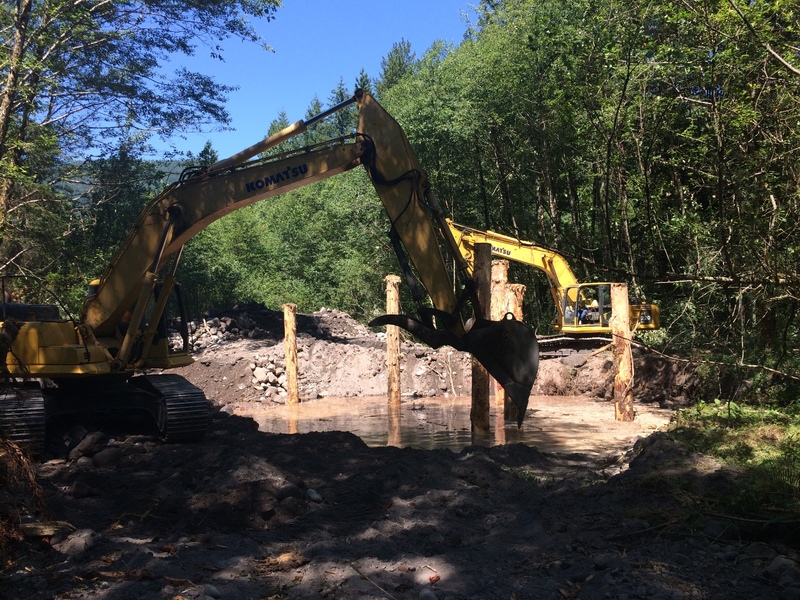 The side channel reconnection near the Timberline Rim neighborhood assists affected landowners in flood-impacted mainstem neighborhoods. This project implemented restoration actions as a demonstration site. The middle Sandy River encompasses priority salmonid habitat, residential development and significant road and utility infrastructure. Partners in this effort included neighborhood residents, restoration consultants from Natural Systems Design, Clackamas County Emergency Management personnel, and Columbia Land Trust.